Holiday.gr - Vathi, a trip to a myth! 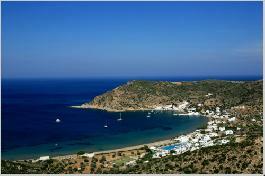 In the west part of the island is the small coastal village Vathi. The closed homonym cove protects the graphic settlement that is a characteristic specimen of the architecture of Cyclades islands. You can reach Vathi by following the new asphalt road from Apollonia or with boats that tour around the island. The village’s beach is famous for her clear, shallow waters ideal for children and for those who can’t swim. In the taverns near the beach, eat fresh fish and try the local recipes. Vathi has a long history in pottery. Many important craftsmen come from this village. Don’t forget buying beautiful ceramics in various patterns. One of the most important sights of the region is the monastery of taxiarchs built in the 16th century. There are rooms to let in the village. Been to Vathi ? Share your experiences!